Hope your weekend is a relaxing one! Ok then, I'm outta here... TTYL! It's time for my Tuesday 7 Kids Your Crafting Supply Store card. 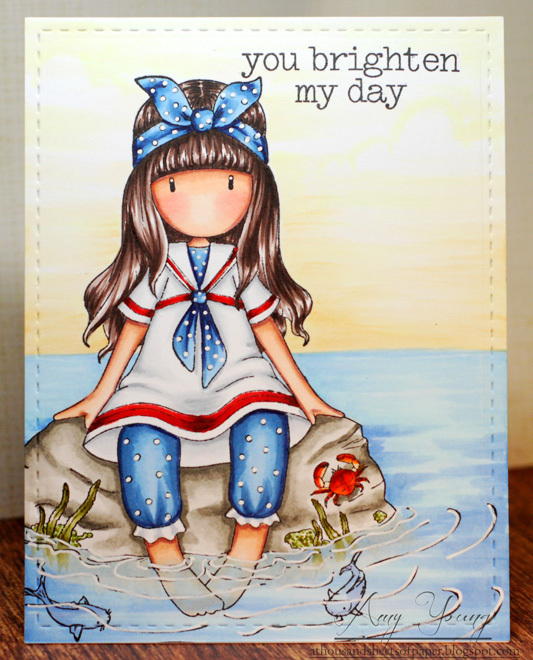 So yesterday morning I opened up my recent order from 7 Kids and the brand new Gorjuss Girl stamps were in there. OMGoodness... they are SO cute! Not only that but they are huge! I have quite the collection of Gorjuss Girl stamps that date back to their beginnings with Sugar Nellie and none of those come close to competing with these beauties in size. Just look at how much space Little Fishes takes up on the front of an A2 card. 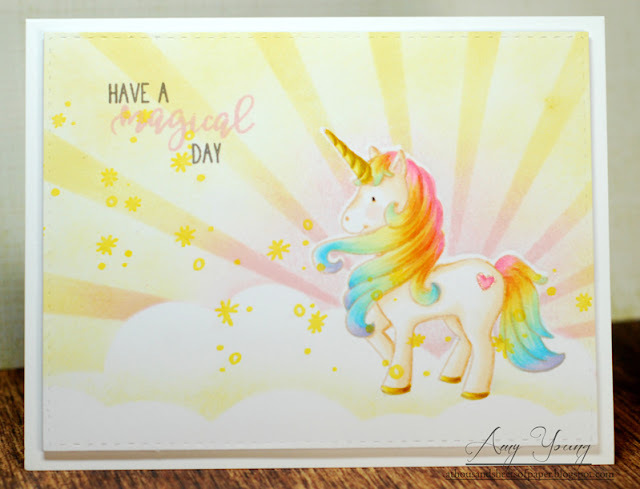 So if you are in the mood to color, color, color and not have to worry about working pattern papers and doodads into a card design these stamps are a colorists dream! 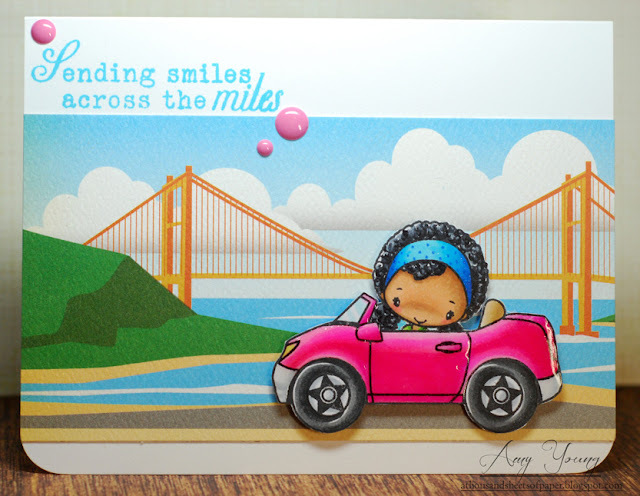 Now don't forget the monthly challenge over on the 7 Kids blog, there is still plenty of time to get creative. Kelly has an awesome $20 gift certificate up for grabs and you could be the lucky winner! Alrighty friends, I'm outta here... take it easy! Ok, I'm off to work... see ya on Monday! Thanks for stopping by my friends! 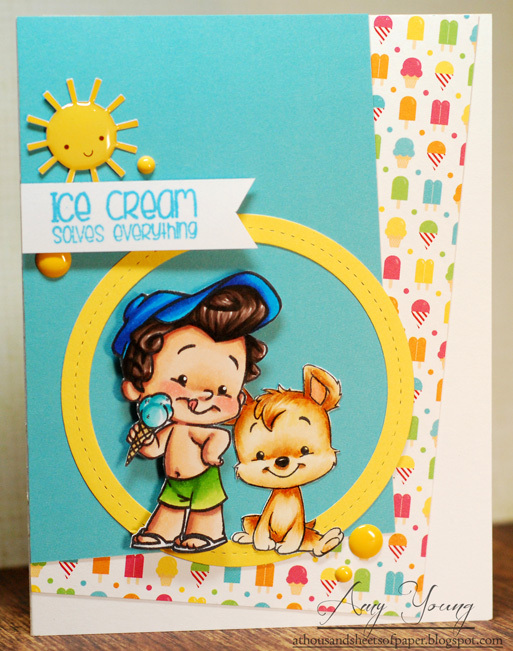 It's Tuesday and that means it's time for my weekly 7 Kids Your Crafting Supply Store card creation. My last box of happy mail included the new Lumberjack Guys stamp set from CC Designs along with the Cabin Fever paper pack. I knew the two would be a match made in outdoorsy heaven and couldn't wait to use them on a card together. 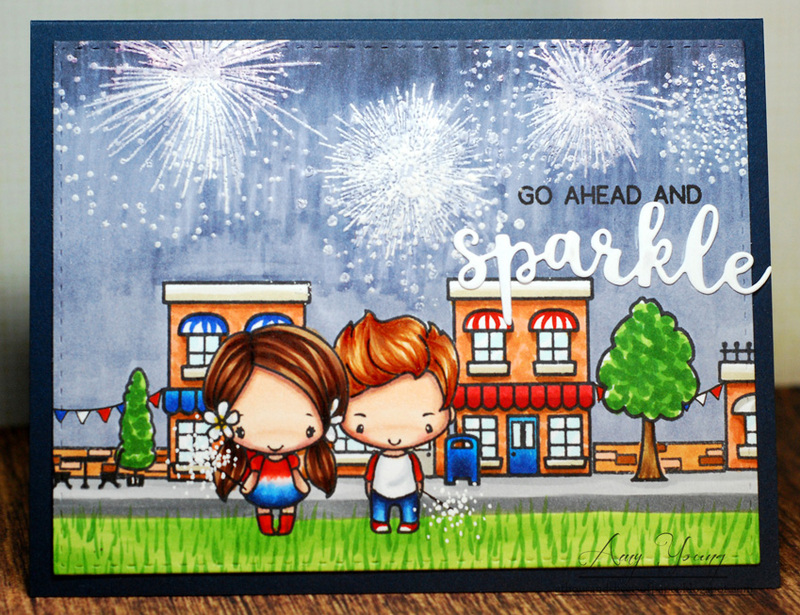 Simple Stories is one of my favorite paper companies because I love all the sheets they have that are divided into multiple little scenes and sayings. Once you cut them apart they are perfect for cards and that is just what I did to get this mountain background. 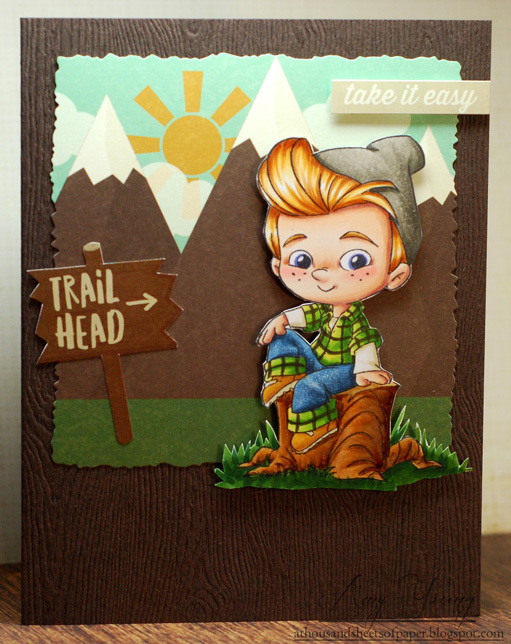 The 'trail head' sign and sentiment are both stickers from the sticker sheet that was included in the pack as well. All that was left to do was pick a lumberjack to live in this high mountain scene and I finally landed on this cutie because I liked that he was sitting on a stump which added a bit more interest. He really pulls the whole thing together with his easy, laid back attitude, don'tcha think? Alrighty, well the July Challenge is in full swing over on the 7 Kids blog and with all the fabulous new stamps and supplies that Kelly has been bringing into the store that $20 gift certificate that is up for grabs could really help to fill a shopping cart! So get crafty and join the fun! 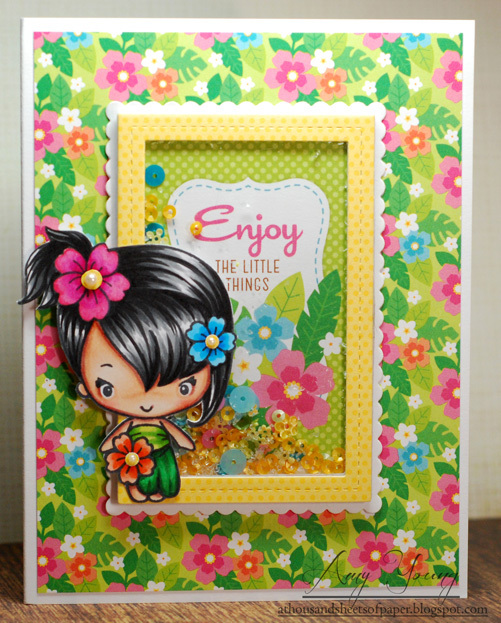 This little Bean from the Bloom Kit is called Jolene and from the get go I thought she had a very tropical vibe about her. So I had set her aside until the right time came along and now here we are. I paired Jolene up with the Fun in the Sun papers from Doodlebug because that floral print was too perfect of a match not to. No surprise that I colored her up to match and I think she looks like the sweetest little island cutie now. 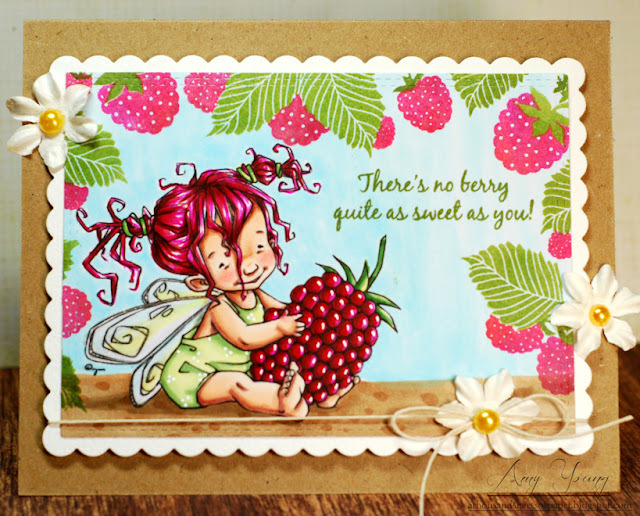 The sentiment also comes from the same 6x6 paper pad and I thought it would be fun to turn it into a shaker so that I could enter this card into the current Farm Fresh Challenge. Ok then, time for me to get ready for the day. Later gators! 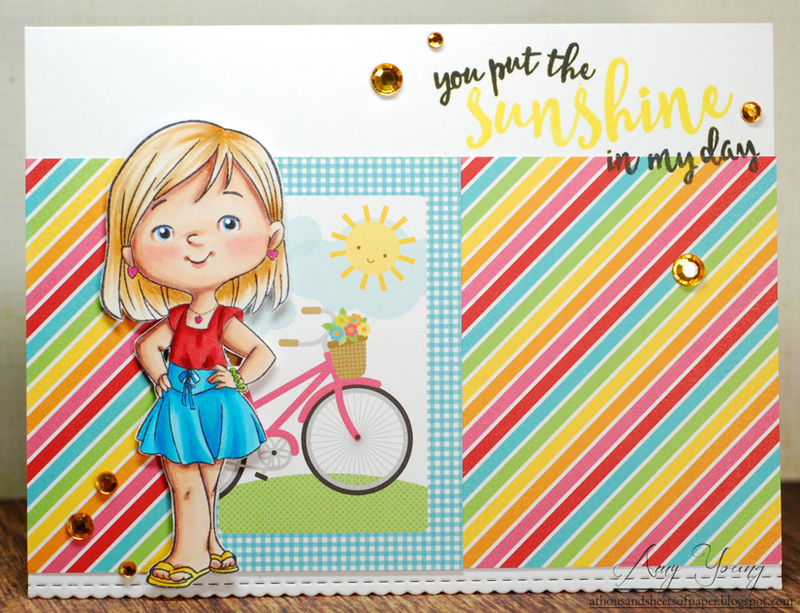 Here she is, little miss Summer from the 4 Seasons Girls set by Roberto's Rascals. I have now officially gotten all eight of these cuties onto cards and I am quite proud of myself. Summer is a sassy looking little gal don'tcha think? I found this bicycle scene in the Sunkissed 6x6 paper pad and I liked the idea that she was out enjoying a leisurely ride to the local farmer's market and got herself a fresh bouquet of flowers. I love days like that, with no where you have to be and nothing you have to be doing... I just wish I had more of them! Alrighty, see you back here tomorrow with his summer girl counterpart. It's the second Wednesday of the new month and that means it's time for the July 'anything goes' challenge over on the 7 Kids challenge blog. 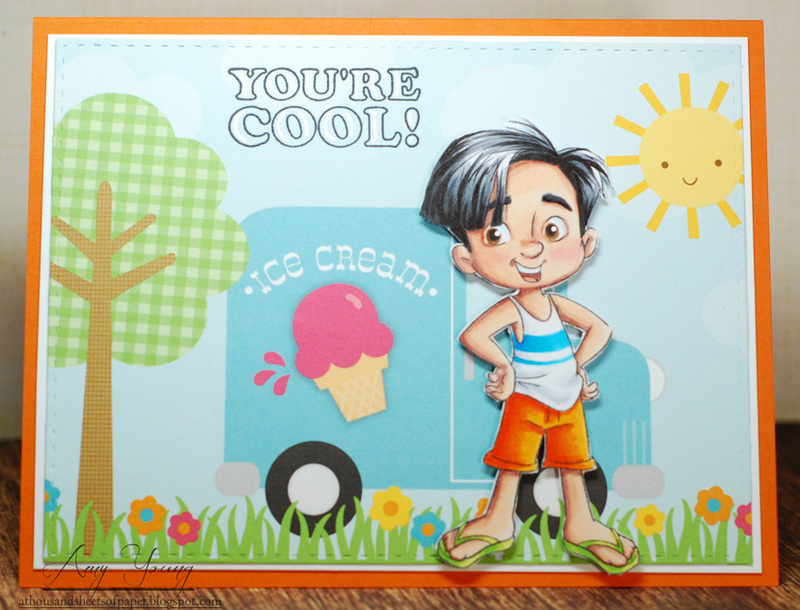 Playing along is easy, all you have to do is use at least one product that can be found in the 7 Kids Your Crafting Supply Store and link back to the challenge blog in your own post, which gives you a chance at winning a $20 gift certificate at the end of the month... who doesn't love that? 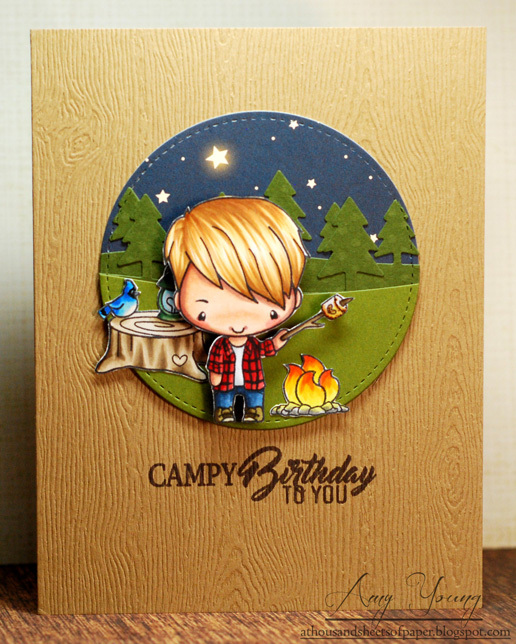 For my challenge inspiration card I pulled stamp sets from two different companies and had fun mixing things up to create a cozy camp fire scene. First off I grabbed this outdoorsy looking guy from the TGF Mini Remix Boys set and then used a bunch of the awesome camping accessory stamps from the new Sugar Pea Designs Easily A-Moose'd set to add to the camping vibe of the card. 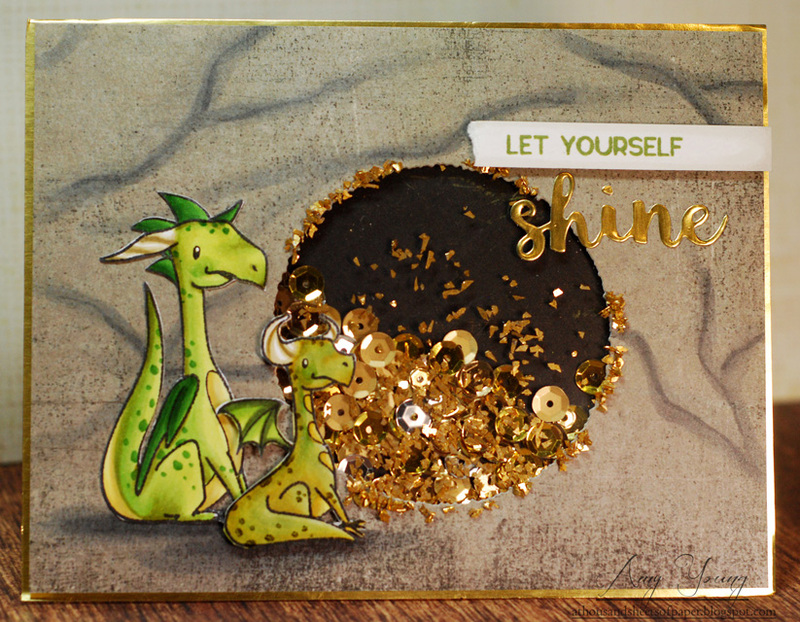 Next I used the cool tree scape border dies to create the background along with some starry sky paper that I found in my stash. Because I wanted to keep the scene rather contained I decided to grab the stitched circle from the Making Waves die set for a very clean and simple design that is still full of charm and whimsy. Alrighty, well the June challenge just wrapped up but be sure to check out the 7 Kids blog tomorrow when July's challenge kicks off! With all the new goodies Kelly has been bringing into the store that $20 gift certificate that is up for grabs could really help to fill a shopping cart! When the temperatures soar into the triple digits how can you resist an ice cold cola? Drinks All Around Piper certainly thinks that they are a good idea and she's got some to share. I knew that I had the perfect papers to go with her but I had to dig around a bit in my crafty room as I am currently in the process of moving it and things are in shambles. Finally I found last year's Simple Stories Summer Vibes collection with the pop cap print paper and I was ready to create. I colored Piper to match those beautiful muted colors but couldn't help but stick with the brighter Coca Cola red for those bottles and the enamel dots. 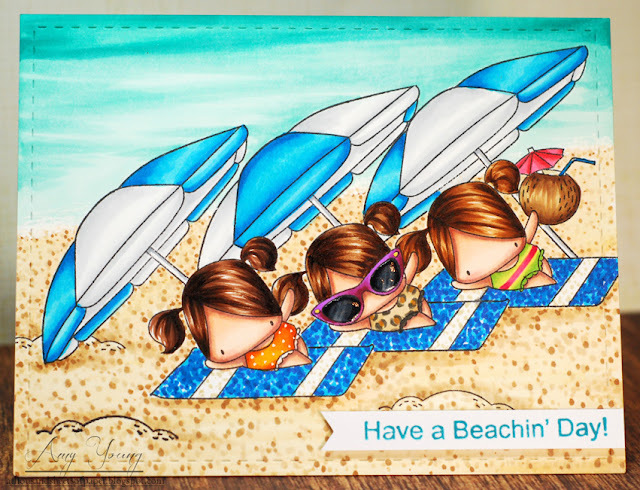 This card definitely says summer to me and I'm entering it into this month's 'anything goes' challenge over on the SOG blog. 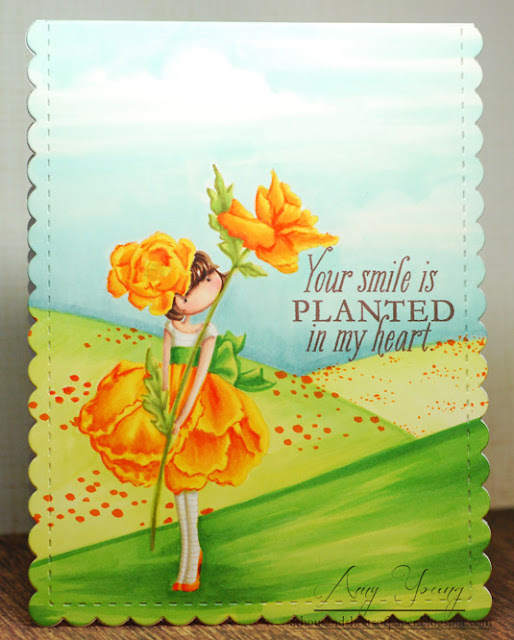 I'm a big fan of the Tiny Townie Garden Girls and I have been hanging on to Poppy here ever since I got her because I knew that I wanted to color her up as my most favorite flower ever... the California Poppy. And there's no better time for California Poppies than summer time. It always cheers me up to see masses of these beautiful orange blooms dancing happily in the breeze so I tried to capture that just a bit in the scene I created for Poppy. I challenged myself to do her in no-line and I gotta say that it was kinda nerve wracking! I struggled with all those petals and keeping them looking separate from each other but am pretty happy with them in the end. 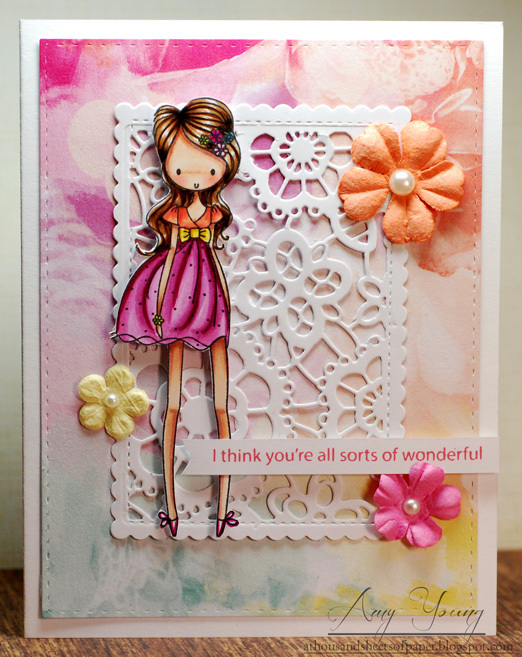 And I'm going ahead and entering this card into the "free form" Bellarific Challenge. 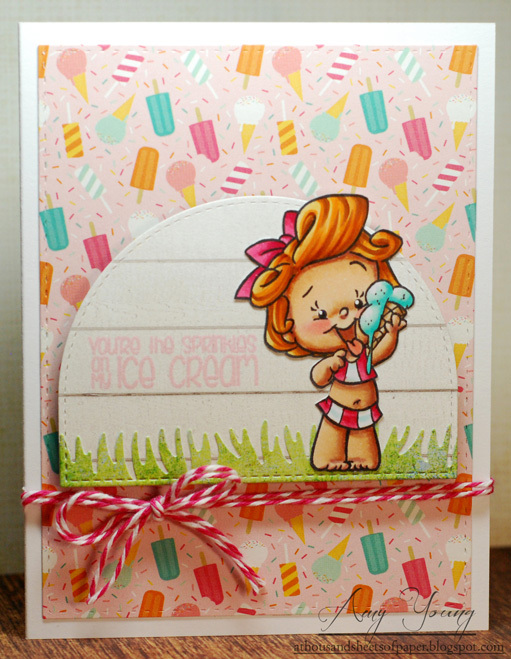 So I found myself with a bit more crafty time yesterday... just enough to color up this darling girl from the CC Designs Ice Scream set. Not just that, but I also had time to pull some pretty papers before coloring so that I could match my Copics to it. It felt good to be back in my comfort zone after many busy days of coloring images without a set plan. The cute ice cream paper was a no brainer but I was just as excited to find this white wood board looking print in the same Summer Dreams 6x6 pad. Doesn't it look like house siding when placed behind her and the grass at her feet? Love that! Scene building doesn't get much easier or quicker than that, LOL! Mmmmm... just looking at her has me craving some bubblegum ice cream. A stop at the local drive-thru may have to happen this afternoon, especially if temps hit 100 today like they are forecasting... yikes! Ok, so between work and 4th of July celebrations I had zero time to get creative yesterday. 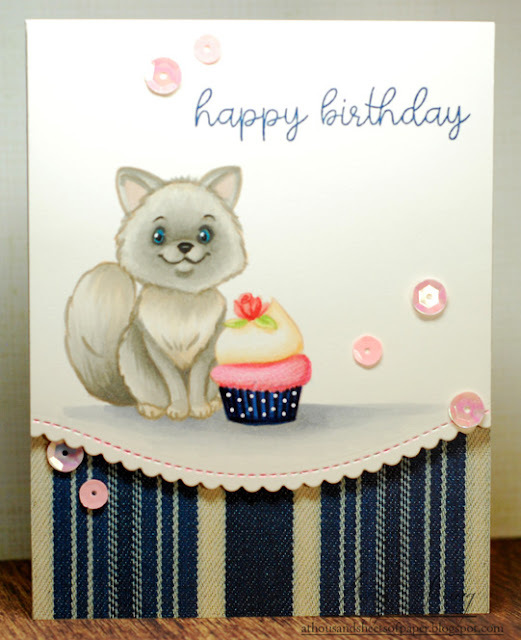 The only thing I had already colored up and ready to go was the Papertrey Ink cupcake for July. I guess that means I'll be sharing two cupcake cards in a single week. This time around I played with coloring on kraft and adding a bit of white color pencil to the frosting for some extra shine. 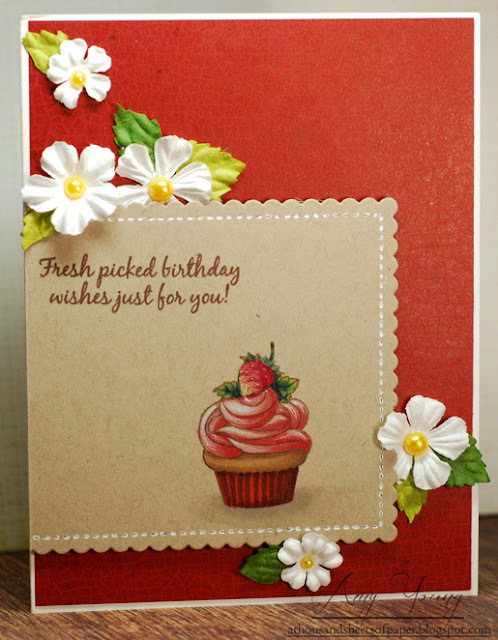 It's a simple and sweet card design that came together super quick. Oh and you still have some time to enter this month's challenge over on the 7 Kids blog. Kelly has an awesome $20 gift certificate up for grabs and you could be the lucky winner so get to creating and join the fun!